Director Wayne Blair delivered the captivating true story of the indigenous Australian singing group, The Sapphires. He managed to tell a uniquely Australian tale and the impact of this talented group on the soldiers of the world during the Vietnam War. Miranda Tapsell was a bright spark in the ensemble portrayed in the musical drama and her talents began to grow across the acting world. Along with acting, she proved to have skills in writing and producing which led her to bring her romantic-comedy of Top End Wedding to audiences. Tapsell takes on the lead role of Lauren Ford who is an up and coming executive in Adelaide and has one of the best days of her life. On the day of her promotion to associate at her firm, her boyfriend decides to propose marriage. Ned (Gwilym Lee) is a disenfranchised lawyer who is trying to find his true calling and while trying to find a new beginning to life, he asks Lauren to marry him. Due to the timing of the announcement, Lauren’s boss gives her ten days to get married and then to get back to work. 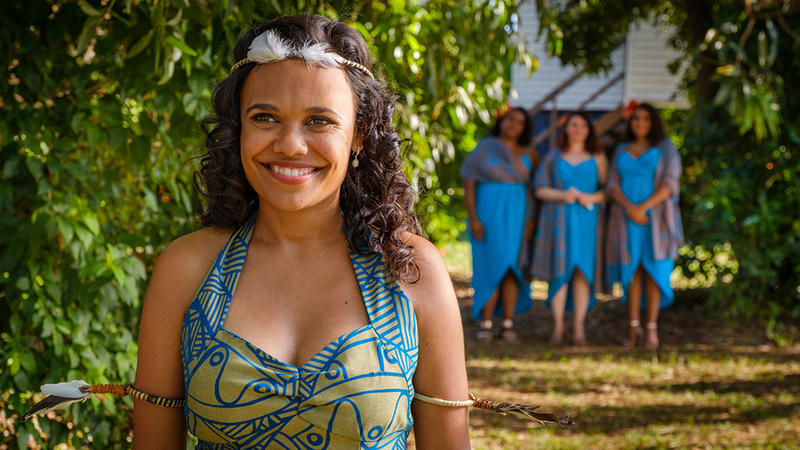 Since the young businesswoman comes from an indigenous Australian background, she decides the wedding must occur in her hometown of Darwin at the top end of Australia. Lauren wants her parents to walk her down the aisle and to bless her marriage to Ned, who comes from a white Australian heritage. Upon her arrival home, she discovers that her parents have been going through difficult times and her mother has gone missing. Realising the importance of her family being part of the wedding, Ned takes Lauren on a journey across the Northern Territory to find Daffy Ford (Ursula Yovich). The adventure unearths the couples past and heritage which delivers painful, comedic and heart-warming aspects that will test their resolve to go through with the wedding. The creative partnership of Tapsell and Blair utilises the geographic and political landscape of Australia as a canvas to address many of the topics influencing modern society. The beauty of the Northern Territory provides a beautiful and fresh perspective for this genre. The vast, extraordinary and sunbaked landscapes of this unfamiliar area of the world offer a vibrant colour palette and light that is not usually associated with Australian cinema. Even though the story addresses the challenges related to marriage and racial tensions, Blair manages to use the beauty of the culture and land to keep the romantic and comedic aspects of the style of the film. Daffy and Lauren Ford’s rediscovery of their Tiwi Islander heritage is handled respectfully while still providing the humorous side of cultural clashes. The script interweaves the element of self-discovery in with the value that each culture has for marriage. The multi-generational elements provide some of the most endearing components of the film and how reconciliation is essential in aspects of life. Tapsell’s script does fall into the pitfalls of trying to address many of the trappings of modern culture. The scenes that involve her hen’s night (bachelorette party) and the statements on the transgender debate cause unnecessary distractions for the overall heart of the story and make this film less accessible to a broader audience. 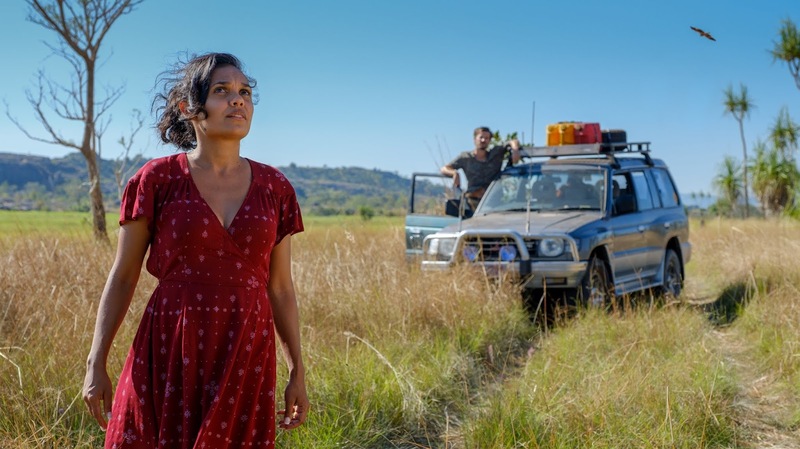 Despite being a less-than-perfect journey through the Outback, it will provide a welcoming option for those looking for a bit of romance, a few opportunities to cry and most importantly an excuse to laugh out loud in the cinema. Top End Wedding will capture the hearts of Australians and provides a beautiful reason to book a trip to the Northern Territory. A beautiful gift of marriage finds its origins in God’s story and how this human bond needs a lifetime of commitment and adaptation to grow. Even with the excitement of the ‘wedding day,’ the real magic occurs as a couple grows closer throughout the years. Each of the marriage relationships in the film depicts the peaks and valleys of this connection and the importance of investment in the lives of husbands and wives.